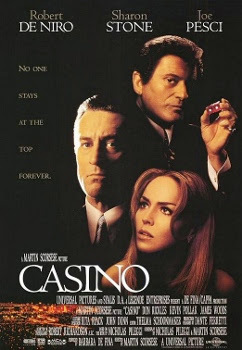 Casino was released on November 22nd, 1995. Filming locations include Las Vegas and Sandy Valley, NV. NOTE: The Glass Pool Inn was demolished in 2004. NOTE: Location during filming was 2955 S. Las Vegas Blvd. Great Job. I have traveled to Vegas regularly since 1990, and know quite a bit of the town and have witnessed the changes. I Love the movie Casino, and just watched it again, noticing additional landmarks. Noticed the snow around Atomic Liquors for the first time (Kansas City scene), and some more. That's pretty fascinating, thank you for sharing! Thanks for sharing! How long did they need the business for? What did Lefty look like? Would love to know. Thanks! Loads of fun to see this collection! Caught myself saying "aaaahhh" about a dozen times. Many thanks ! Fantastic job on this! Also really enjoyed the Breaking Bad & No Country For Old Men pages, and I'm about to dig in to more. I have a correction for one section up there, which you listed as "The Landmark". That awesome "Googie" building was actually the lobby of the old La Concha Motel, and as you stated is now found at the Neon Museum, serving as their entrance. It's too bad you didn't snap some photos of the old Riviera, because that was the location for much of the interior casino shots. As you may or may not know, the Riviera is the latest victim of "Implosion Fever" and has just been erased from the North Strip. The Riv was the last remaining original resort structure left, other than parts of the Tropicana further South. Myself and hundreds of others gave our best effort to prevent this obliteration of Rat Pack proportions, but greed & ignorance prevailed yet again. Another sad fact regards the Stardust, which was the true subject of the film "Casino", was also unceremoniously blasted into oblivion in 2007, (along with the bungalows from her sadly-underappreciated neighbor the Royal Nevada/ Stardust Auditorium) only to be replaced by a rotting, unfinished multi-million dollar behemoth known as The Echelon. It's truly a bona fide tragedy that Las Vegas has less than zero regard for their heritage & history! ...and on that note, anyone interested in helping to preserve what little is LEFT of old Las Vegas & her countless characters & their tales of bygone eras, is welcome to join us at Project: Viva Lost Vegas, which is a history/ charity endeavor I'm working on. Fantastic! I would love to know where the INTERIOR house shots with Lefty and Ginger were done. Probably not the same as the exterior house you have pictured. Thanks! I think the entire home was used. I have lived in Vegas for 20 yrs now, I have been by the house several times, from what I have heard They used the whole house, you can see the spiral staircase from the street in the upper room where Ginger breaks into the desk. and it backs up to the gold course where the agents landed. Does anyone know what specific scene La Concha motel was in?